Few days ago it appeared a book about Russian – European union relations, edited in Moscow by professor Evgeny Pashetsev and Erik Vlaeminck. 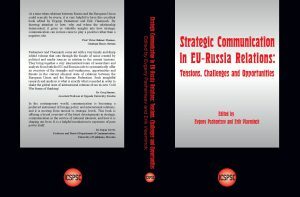 The title of this book is : “Strategic Communication in EU-Russia Relations: Tensions, Challenges and Opportunities”, published on Moscow by The International Center for Socio-Political Studies and Consulting (ICSPSC), with the academic support of the Institute of Contemporary International Studies and the Department of International Security at the Diplomatic Academy of the Ministry of Foreign Affairs of the Russian Federation and European-Russian Communication Management Network (EURUCM Network), 2018. From the official presentation we mention: “Since the outbreak of the Ukrainian crisis, the relations between the EU and Russia seem to be in a constant process of deterioration. In an attempt to go beyond traditional analyses, this book wishes to present the under explored role of strategic communication from a Russian and European perspective and this, through an interdisciplinary approach addressing security, international relations and economic issues. An international team of researchers from the EU and Russia endeavour to provide answers to the major tensions and challenges, in order to create a basis for reconciliation through dialogue and the rethinking of strategic communication in EU-Russia relations. Nine different case studies engage with a variety of issues ranging from geopolitics and security to diplomacy. This book is useful for researchers, specialists and students interested in strategic communication within the context of the current EU-Russia relations”. The foreword was written by Franco Frattini. Appreciations on this volume are made by professors from Chatham House, University of Uppsalla, University of Queensland, Brisbane, University of Ljubljiana and the Institute of National Problems at the National University of Lanús, Аrgentina. We thank to professor Evgeny Pashentsev for the announcement about this book.